Tunisian home ministry Monday announced the arrest of a suspected terrorist near the Libyan border as he was attempting to join terrorist groups in splintered Libya, reports say. Tunisia authorities have been on high alert at their borders with division-ridden Libya, as they fear free crossing into Tunisia of elements of the Islamic State group (IS) being crashed in Sirte. 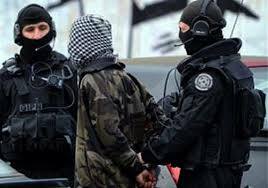 The suspected terrorist, according to the home ministry, was flagged dangerous and wanted by security authorities for his involvement in terror acts at Gorjani; in Tunisia and for terror attacks against a police establishment at Midoun-Djerba; in the Médenine Governorate. Thousands of Tunisians have reportedly left the country to join terrorist groups in hotbed conflict zones; mainly Iraq, Syria, and Libya. Authorities are worried the returnees will pose a threat to the country’s security. Three terrorist attacks rocked the North African country last year, killing 71 people most of whom were foreign tourists. The attacks were perpetrated by young Tunisians believed trained in IS training camps in Libya. Posted by Khalid Al Mouahidi on September 27, 2016. Filed under News. You can follow any responses to this entry through the RSS 2.0. You can skip to the end and leave a response. Pinging is currently not allowed.